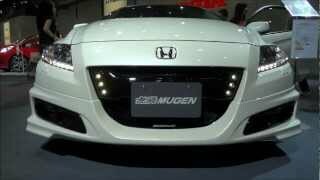 If you're a fan of the Super GT series then you'll most likely be happy to learn that this year Honda Motor Co. Ltd announced that they will provide technical support to Team Mugen, mainly in regard to the MUGEN CR-Z GT 2012 racing car. The CR-Z will make its debut on July 28th when it will race in the GT300 class on the Round 4 SUGO GT 300km race. The racer is equipped with a 2.8 liter V6 twin-turbo engine thanks to Honda, and it will be mated with a racing hybrid system developed and tailored solely for this particular Team Mugen racing car. Unfortunately little is known at this point and performance figures have not been made public so far, but be sure it will definitely surpass the performance figures given by the 1.5 liter 122 horsepower engine found on the standard Honda CR-Z 2012. 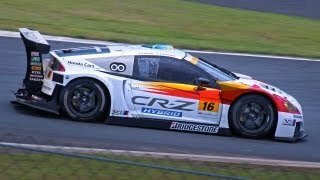 However, to narrow down the search, keep in mind that racing cars in the GT300 class are limited to 300 horsepower, so the CR-Z will most likely find itself somewhere around that area, but not above it. As for what other changes have been brought to the CR-Z by Team Mugen and Honda, in terms of technical stuff once again they kept quiet, but as far as the exterior goes, we can see that the racing car has been fitted with a wide body kit, a huge wing on the back and slick Bridgestone tires for maximum grip. 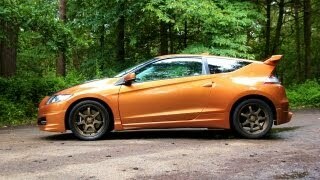 The standard CR-Z 2012 looks amazing, but the MUGEN is breath taking. It looks like the awesome toy you always wanted to have as a child. We're eager to see how it will perform on July 28th but in case you are still wondering what are its performances check back with us later, as Honda and Team Mugen might spill the beans regarding the matter once we're going to get closer to the race car's debut.